2Q15 gave powerful evidence to the tectonic plate shifts remaking the TMT landscape. Those change vectors will drive 3Q15 earnings as well, creating significant investment opportunities and risks. Specifically: 1) The deterioration of the linear TV model continues, fueling growth for NFLX and GOOG and yielding painful admissions from traditional media execs. 2) TWTR, with a permanent CEO, splashy new product features, and planned job cuts, may be setting itself up to move out of the dog house. 3) The enterprise cloud is moving FAST. AMZN’s AWS and MSFT’s Azure are putting up huge growth and introducing new IT-friendly services – good for them and BAD for traditional IT vendors. 4) AMZN is killing it in e-commerce – its growth will hurt everyone else. 5) TMUS should continue its hot streak, taking phone subs from everyone and growing revenues and margins. 6) AAPL has one last easy compare and a stagnant worldwide market for high-end smartphones – a beat won’t mean much for the share price. TV swoons. Fall TV ratings have been very poor. Spot prices for primetime advertising are down. Pay TV sub declines have been accelerating. 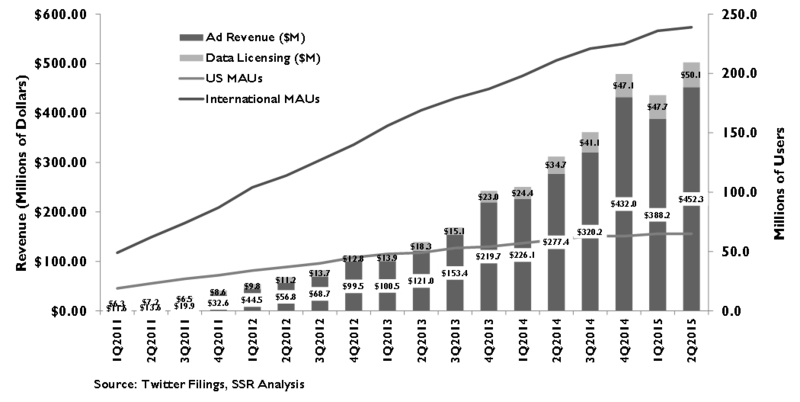 Video streaming services have been growing viewing hours and revenues at high double digit pace. There is nothing to suggest that any of this is likely to reverse, and history suggests that these changes are more likely to accelerate than not. Of course, heading into the seasonally strong Holiday quarter with 2016 election spending ready to begin in earnest, media and cable executives may be inclined to spin weak 3Q results toward optimistic 4Q guidance, but we are very skeptical. 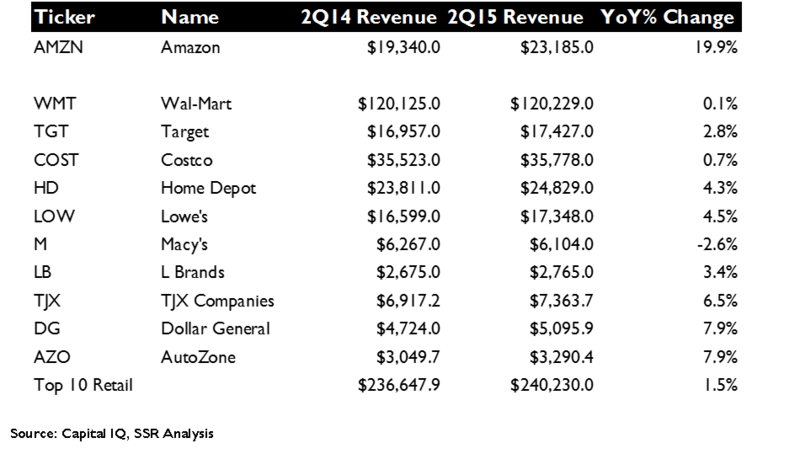 Meanwhile, we expect NFLX and GOOG to continue their 2Q15 excellence. Jack is back. What to make of TWTR? Shares shot up in early Oct. with the CEO announcement, followed by the launch of Moments, a planned expansion of the 140 character limit, an extension of the Buy button to new partners representing 100K merchants, and a team-up w/ GOOG on the AMP program to accelerate the loading of web pages. Then, reports of possible layoffs killed most of those gains. We expect management to make a strong case that all of this is bullish – 61% sales growth in 2Q on strong ad monetization should continue in 2H; Moments, improved on-boarding and a planned ad blitz should revive MAU growth; and pruning TWTR’s bloated employee roles should move it more quickly to profit. If @Jack can get that MAU needle to move, this stock has a LOT of upside to come. Clouds are gathering. In 2Q, AMZN grew its AWS cloud business 81% YoY, and just announced a raft of new features to make it easier and more attractive for traditional enterprises to move their computing onto AWS. MSFT, while still much smaller in the hosting business, topped that with 96% growth for Azure. SaaS vendors, like CRM, WDAY, DATA, N, NOW, SPLK, and others, continue to post strong double digit sales growth. Meanwhile, business at traditional data center equipment and software companies is sad, and EMC’s take-out by Dell aside, we believe managements have not offered credible plans for long term survival, much less success, in a cloud dominated future. We expect more of this in 3Q15, and favor MSFT, AMZN and the SaaS names. Who can challenge AMZN? In 2Q15, AMZN grew its e-tail business 26% YoY despite considerable FX headwinds, with a recent study showing 44% of mobile shoppers starting with AMZN vs. 21% for all other retail apps and sites combined. In contrast, the top 10 US retail chains grew an average of 1.8%, with WMT showing dead flat sales. Indeed, WMT’s touted e-commerce efforts, less than 1/10th the size of the merchandize sold through AMZN, decelerated to just 16% growth in the quarter. A recent survey showed 44% of US online shoppers go directly to AMZN, with just 21% starting on any other retailer’s site or app. We expect this widening gulf to be clear in 3Q15 earnings. TMUS is harvesting subs. In 2Q15, VZ, T and S all saw ARPU erosion, weak post-paid phone subscriber numbers and declining wireless revenues. T-Mobile added 2.1M post-paid subscriptions and grew its wireless revenues by 11%. This is a classic Clay Christensen “Disruptive Innovation” case of an upstart attacking from the bottom and winning. Nothing has happened that will stall this momentum. One last hurrah for AAPL. Consensus projects 22.4% topline growth for AAPL in its 4QFY15 with an abrupt stall to 3.1% growth in the December Q. AAPL announced that first weekend sales for its iPhone 6S models were 13M, topping last year’s sales by 2.5M units. However, 4QFY14 sales did NOT include China, suggesting that there may be little or no growth on an apples-to-apples basis. We believe that FY15 iPhone sales have pulled substantial upgrade sales forward and that demand for the 6S models may suffer as a result. If so, consensus revenue expectations for FY16 may be too high. Despite the likelihood of topline disappointment, we note that margins for the iPhone 6 and for the Apple Watch are likely higher than expectations, leaving room for earnings to fare better than sales. 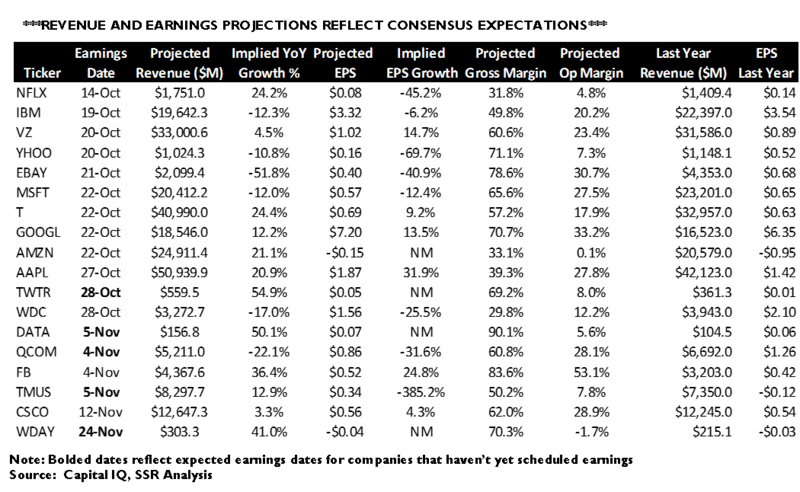 Top picks for 3Q15. Paradigm change is creating upside opportunities for a number of large cap stocks in the TMT universe. We believe that TWTR, TMUS, AMZN, GOOG, MSFT, and NFLX are likely to deliver combinations of financial results, guidance and management commentary to drive their shares higher through 3Q15 earnings season. In contrast, we are particularly concerned for IBM, CSCO, VMW, HPQ, FOXA, VIA, SNI and T.
2Q15 earnings were eventful, reflecting a major inflection point in linear TV, the big reveal for Amazon’s AWS, T-Mobile with the only growth in US wireless, signs of erosion in the iPhone 6 juggernaut, and Amazon stretching out its lead in e-commerce. We wrote about those signposts pointing toward generational sea change (http://www.ssrllc.com/wp-content/uploads//ftr/15.01.14-Ten-Investible-Things-in-2015.pdf), most of them obscured by the August market correction. Although perhaps out of mind for the moment as investors chew on interest rate possibilities and fret over the Chinese economy, the trajectories suggested by those 2Q results are likely to continue play out in 3Q as well. Fall TV ratings and advertising spot pricing have been poor. 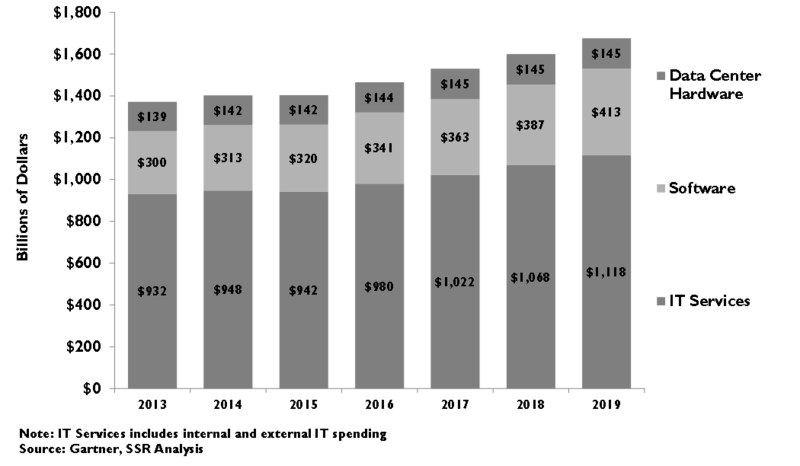 3Q is typically a weak quarter for pay TV. There is no reason to believe that the lackluster ad revenues and declining subs won’t be just as much of a problem this quarter as last, and they might have gotten worse. FOXA, DISCA, SNI, CBS and VIA would seem to be the most at risk. Meanwhile, NFLX and GOOG’s YouTube are having no problem delivering extraordinary revenue growth – NFLX even took a price hike this past week. A similar dichotomy is evident in enterprise IT. The leading cloud hosts – AMZN’s AWS, MSFT’s Azure and GOOG’s GCE are gaining share in an already fast growing market. The top SaaS applications venders – CRM, WDAY, NOW, N, DATA, SPLK, and others – are signing subscribers, building recurring revenues and gaining the leverage to drive profits. Old IT – IBM, HPQ, CSCO, NTAP, ORCL, VMW, SAP, etc. – is struggling as CIOs muzzle spending on their internal data centers as they explore the cloud. This is not going to get better. AMZN is also accelerating in its core business despite its massive size. Brick-and-mortar competitors like WMT, TGT, and others are talking a good game, but continue to choke on AMZN’s exhaust as they struggle create compelling “omni-channel” solutions. TMUS is also on a roll, harvesting subs with its aggressive “uncarrier” program – it grew its 2Q15 wireless revenues 11% YoY while all of its rivals posted declines. Again, there is no reason to think that either of these trends has reversed. TWTR and AAPL will be particularly scrutinized this quarter. TWTR looks ready to run, having named Jack Dorsey as permanent CEO and introduced a swath of improvements to its service for both consumers and advertisers, all in short order. Reports of job cuts have hit the stock, but expect management to talk up increased efficiency and a 4th quarter marketing blitz as a stimulus for re-energizing MAU growth. On the flip side, AAPL will likely spin its decelerating iPhone sales, but probably not well enough to assuage investors appropriately worried about the killer compares ahead in FY16. One potential bright spot? Margins. Expect 4QFY15 profit to be ahead of the line, even though sales are likely to be behind it. Our top picks for earning season are TWTR, TMUS, AMZN, GOOG, MSFT and NFLX. While we see upside for all of the stocks in our model portfolio, these are the names most likely to upside over the next month. On the short side, any media company with dependence on linear TV is in question, but FOXA, SNI and VIA seem the most vulnerable. Similarly, we are almost universally down on traditional IT players. The blockbuster Dell/EMC deal could portend further consolidation, but it could also be an ill-advised one-off. We see struggles for IBM, HPQ, CSCO and VMW amongst many, many others. 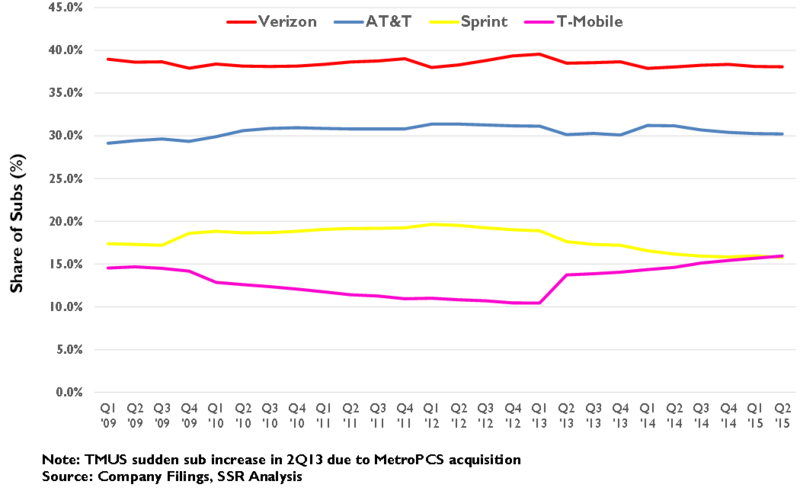 We also see damage to VZ, T and S as TMUS continues its harvest – T, hot off of the DTV acquisition, may be the most vulnerable. As for AAPL, we see it as dead in the water until the December numbers settle the bull-bear tug of war. It is just a matter of time. TV audiences are shrinking. Advertisers are shifting their budgets. Pay TV distributers are losing subscribers. This is not a short term phenomenon, nor is it likely to progress gradually. We have written about this extensively (http://www.ssrllc.com/2015/08/august-12-2015-video-media-the-cord-cutting-myth-gets-real/ and http://www.ssrllc.com/wp-content/uploads//ftr/15.02.03-TV-Advertising-Golden-Years.pdf). In the long term, linear TV networks will fade away, hurting the media companies that own them. In their place, on-demand streaming services, like Netflix, YouTube, and Amazon Prime will flourish. Maybe some linear TV brands, like HBO or ESPN, will make it across the chasm as successful streamers. Maybe some also rans or newbies like Hulu, Sling TV or Apple TV will find a model that works in the new world. In the near term, the movement toward that future will be painful for investors in the linear TV model. Early season ratings for primetime TV have been very disappointing, with CBS the only major network to show YoY improvement. The spot market for advertising has also been weak, with 62% of network programs showing price declines vs. 2014 (Exhibit 2). Pay TV subscriber growth has been decelerating for nearly a decade, turning increasingly negative over the past 4 quarters. All of this is mutually reinforcing – changing viewer habits are driving poor ratings which are driving weak advertising which saps investment in new programming which contributes to changing viewer habits. Last quarter, this dynamic prompted sobering comments from network executives, including Disney’s Bob Iger, who spooked investors with frank talk about ESPN’s advertising and subscriber trends. We expect more of the same, perhaps tempered by seasonal enthusiasm for the historically strong 4th quarter. With TV media companies still trading at growth multiples, this is a substantial risk. Cable MSOs have a bit more leeway, with growth and rich margins still coming from their near monopolies in residential broadband, but the news on the pay TV subscriber front is unlikely to be good. Over the past decade, subs have gone from 2%+ growth to nearly 1% declines in an environment of consistent new household formation. Cord cutting is real and is almost certain to accelerate in a world of improving streaming alternatives and ever higher monthly prices (Exhibit 3). The beneficiaries are on-line. Netflix is adding subs at a 30% annual pace and just announced a 12% price increase (Exhibit 4). Google’s YouTube is growing its viewing hours at 60% and advertising revenues 100% YoY. We expect both companies to have good news to report this quarter and to point confidently to the further opportunities ahead in 4Q and beyond. Last week, Twitter seemed to finally found some wind at its back. Founder Jack Dorsey was named permanent CEO and the subsequent positive news flow – the introduction of the Moments curated story product, the reports of an end to the 140 character limit which has constricted Twitter as a news distribution medium, the expansion of the Buy button to Shopify, Big Commerce and Demandware and their 100,000 merchant customers, the partnership with Google on an open standard to greatly speed the delivery of web pages from app links – suggested a company ready to build momentum with investors. As of Friday, the stock had gained more than 25% in the month of October. Not so fast. This week, a story in the Wall Street Journal suggests a round of employee layoffs are coming. While this is fairly subject to a wide range of interpretations, the market is not yet willing to give Twitter the benefit of the doubt, clawing back a third of those October gains. While pessimists may see job cuts as a harbinger of revenue disappointments, we see them as an acknowledgement that Twitter had become bloated with engineering expenses out of whack after an indulgent IPO and several employee heavy acquisitions. Proactively getting a handle on this suggests that the new sheriff intends to be more careful with shareholder dollars. If job cuts were intended as the response to a sales disappointment, there is not a lot of reason for Twitter to leak the story to the WSJ AHEAD of earnings. We think @Jack and company will have confident story to tell. 2Q15 results, although widely pilloried for their stagnant MAUs, saw sales up 61% (Exhibit 5). At the time, Dorsey was just an interim CEO and with former banker Anthony Noto as CFO it would not be at all surprising if the company entered 3Q with a bit of dry powder to give the eventual permanent choice a running start. Moreover, 4Q will bring Twitters first major advertising campaign ever to support the launch of Moments and an improved on-boarding process, and to educate new and lapsed users on the unique value created by the service. This is long overdue. The reward greatly outweighs the risks here. A reacceleration in monthly registered users and a clear vehicle for monetizing the hundreds of millions of unregistered users that the company claims could move this stock much higher very quickly. Enterprise server sales are in decline after years of deceleration. Storage system sales are following server sales down the deceleration curve and are near the inflection point where growth shifts to decline (Exhibit 6). So why not combine the second largest server vendor with the biggest supplier of enterprise storage systems. It is probably true that EMC is better off under private ownership willing to milk a declining cash flow annuity than it is as a public company, but the $65B deal with Dell is hardly a vote of confidence for the remaining data center players left in the market. 2Q15 was tough. Most of the big enterprise IT players – IBM, HPQ, ORCL, etc. – are in decline. A few others – CSCO, EMC, NTAP, etc. – are eking out de minimus growth and seem destined to be the next shoes to drop. All of these companies have found cloud religion and are banging the drums for customers and investors alike to buy in to their particular versions of a hybrid cloud future with proprietary systems, customer lock in and, importantly, growing profits for themselves. It is a hard scenario to believe. The landscape is also welcoming for SaaS application players, with the caveat that even successful SaaS players will eventually have to come to grips with the advantages of the web-scale infrastructure players. The top SaaS app companies – CRM, WDAY, NOW, DATA, SPLK, N, etc. 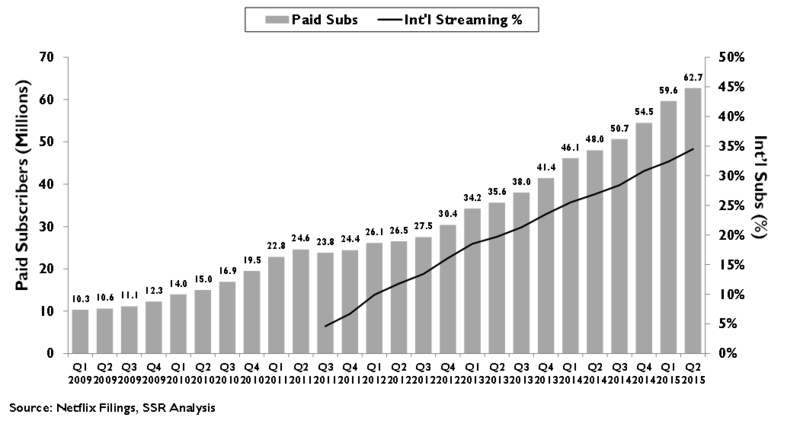 – are all growing well in double digits while their packaged rivals shrink. For investors, we think the story is a simple as it appears. We favor the cloud names – AMZN, MSFT, WDAY, DATA and ADBE are all in our model portfolio. We are concerned for the traditional IT names – IBM, HPQ, CSCO, NTAP, ORCL, VMW, and SAP come to mind. Amazon’s 2Q15 was a revelation. Not only was it the coming out party for AWS, but it also marked a dramatic reacceleration of the company’s e-tail business into the face of a fierce FX headwind. Sales in “Electronics and other general merchandise” – containing most of the company’s e-commerce business – were up 26% despite a 7% currency impact. In comparison, the 10 largest US brick and mortar retailers averaged 1.8% YoY growth for the quarter. Vaunted WalMart, which has invested heavily to play catchup to Amazon in e-commerce, failed to keep pace with its overall sales flat and its online operation growing just 16% in the quarter. A recent study by BloomReach found that 44% of American shoppers began their product searches directly on Amazon, with only 21% beginning with any other merchant site or app. While traditional merchants blissfully plan a long slow roll out of their app based loyalty programs, Amazon is embedded with their customers and taking an ever larger share of their business. We expect this to grow more obvious in 3Q15 and beyond. T-Mobile is in the competitive sweet spot. The rise of mobile data and the relative decline of voice calling in the priorities of American wireless consumers has damped the traditional spectrum advantage enjoyed by the market leaders Verizon and AT&T. Competition is less about “Can You Hear Me Now?” and filled in coverage maps, and more about fast, available and cheap wireless data capacity. On one side, Verizon and AT&T are working to prop up their pricing umbrellas and sustain their unsustainable ARPUs – they can’t afford to compete head to head with T-Mobile’s cheap and open “uncarrier” plans. On the other side, Sprint continues to struggle to deliver competitive service over their complicated tangle of frequency bands. Meanwhile, T-Mobile continues to harvest subscribers from all three. It was the only network to grow wireless service revenues in 2Q15 and we expect more of the same in 3Q15 (Exhibit 9). Meanwhile, we believe that there is considerable bottom line leverage to play out as it grows. We have written about all of this in detail. (http://www.ssrllc.com/wp-content/uploads//ftr/15.07.09-TMUS-Wireless-Ain%E2%80%99t-What-it-Used-to-Be.pdf) Heading into earnings season, T-Mobile remains one of our favorite names, while T, in the midst of its DTV integration, seems at the greatest risk. With Apple down nearly 20% from its summer highs, Apple bulls are beside themselves. From their perspective, the iPhone 6S with 3D Touch is a major improvement over last year’s iPhone 6. 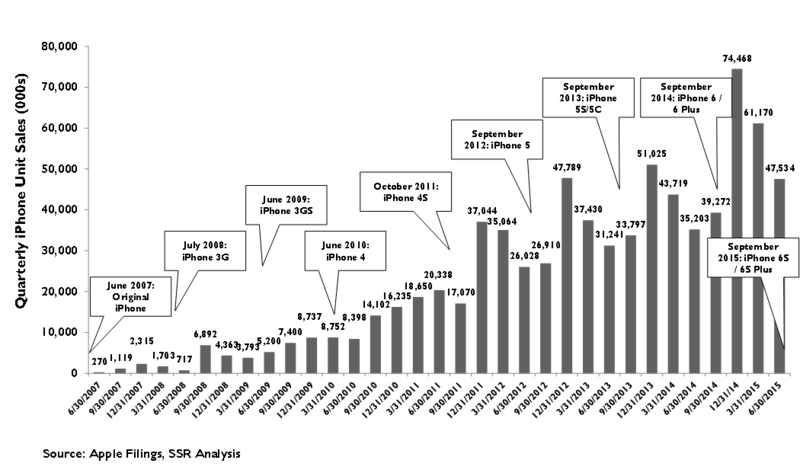 Only 35% of Apple’s installed base has upgraded to an iPhone 6, leaving a huge market of future upgrades. Moreover, Apple’s new trade-in plan will accelerate replacement behavior worldwide, driving even more demand. Furthermore, the Apple Watch is poised to be the THE product for the Holidays. In this scenario, Apple can grow its sales in the high single digits for FY16 while taking margins ever higher – strong buy, target price of $160. We don’t see this as very likely. The 6S has some real improvements to its techy internals, but none of it is all that apparent or appealing relative to the iPhone 6 for the average user. The iPhone 6 and 6 Plus introduced large format screens to the Apple world, unleashing a flood of pent up demand – some of it from owners of competitive products but the very large majority of it from existing iPhone users. Many of those users upgrade their phones early to get a new model – you can see the effect in a huge step function jump in US replacement activity over the past year (Exhibit 11). 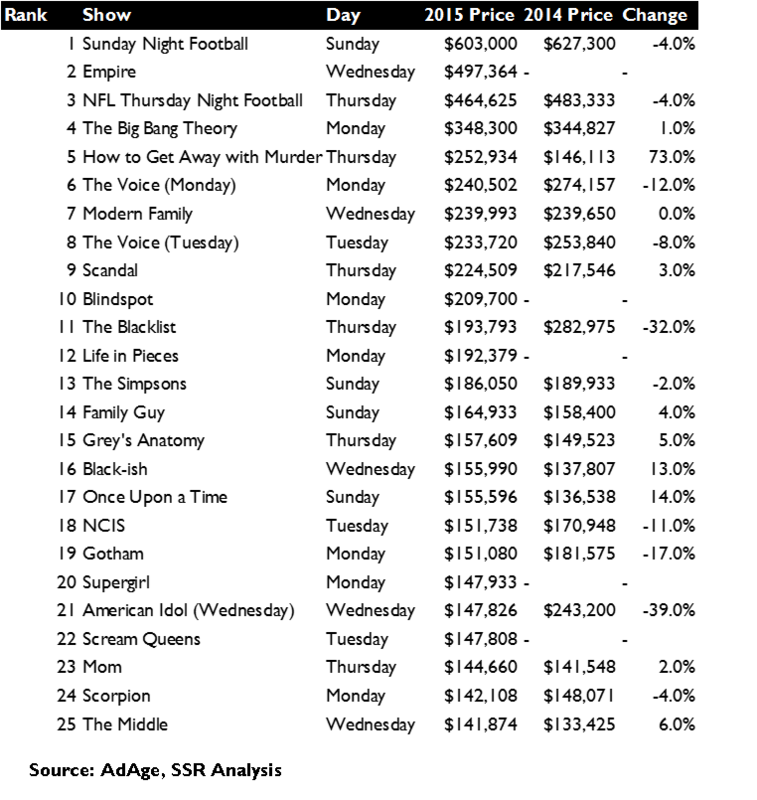 We have written about this in detail (http://www.ssrllc.com/wp-content/uploads//ftr_tmt/15.09.30-Smartphone-Mobile-Maturity.pdf). 35% of the installed base may not seem like a lot of upgrades, but remember that used iPhones are the dominant sellers in the secondary market and many of the 65% of non-upgraded iPhones come from the used market. US and Asian replacement rates are already at all-time highs, and are more likely to come down than go up further. 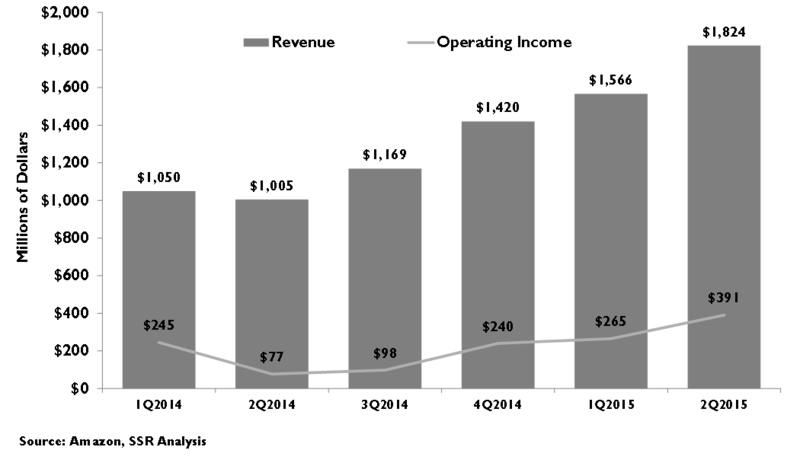 Finally, sales of the Apple Watch are insignificant in the context of Apple’s $230B in annual revenue. 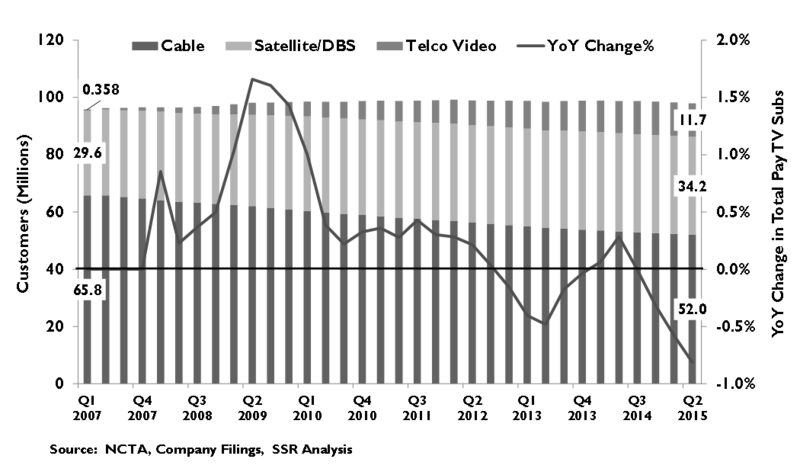 Even if sales indicators were positive, which they are not, it wouldn’t really matter. In the long run, we are unconvinced that the wristwatch form factor is likely to be more than a niche product. In this scenario, iPhone unit volumes are very likely to be disappointing, if not this quarter, then next. The maturity of the high-end smartphone market overall will make it very difficult for Apple to deliver growth from its current sales level, and thus, make it difficult for Apple stock to appreciate despite its relatively modest earnings and cash flow multiples. In the short run, we see room for Apple’s extraordinary margins to go even higher – the watch and 6S both appear to offer opportunities for superior profitability. This may be enough for investors until the first real disappointment on iPhone unit volumes in December. Our top 6 stocks for the 3Q earning season are TWTR, TMUS, AMZN, GOOG, MSFT, and NFLX for the reasons detailed in the paragraphs above. We expect the combination of results, guidance and management commentary to take shares higher. 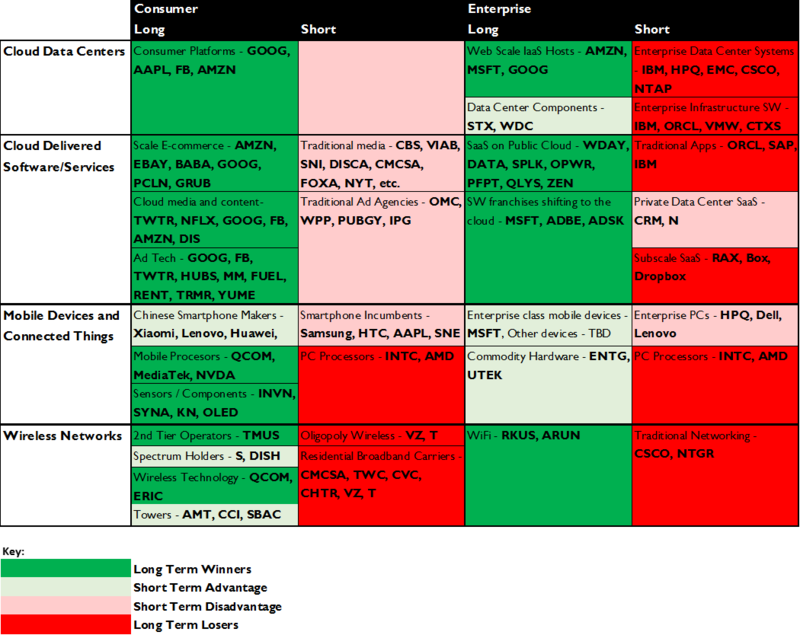 In contrast, our least favorite stocks are IBM, CSCO, VMW, HPQ, FOXA, VIA, SNI and T.